A major component to yoga is opening up the body. Half Moon Pose Begins this process. Half Moon Pose uses opposing muscle groups to open up and stretch the front, back, right side, and left side of the body. 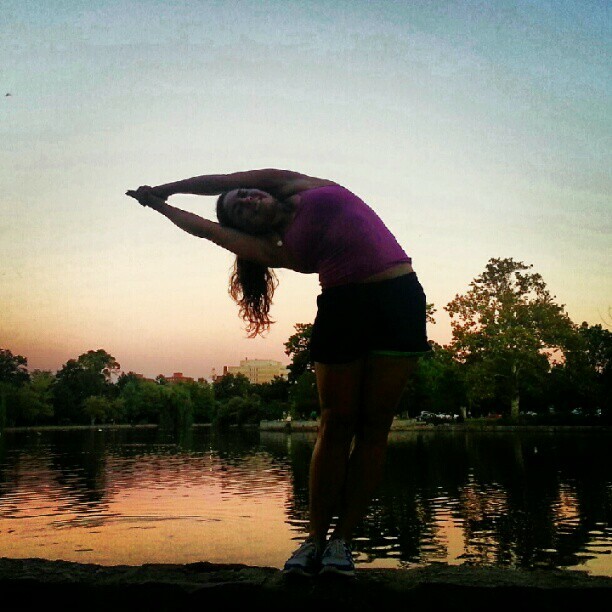 Half Moon Pose is an energizing pose that prepares you for class! It uses almost every muscle in your body continuing to warm up the body stimulating the sweat you started to form in Breathing to continue! Here are some keys to improving your Half Moon so you can begin “natural human traction” sooner rather than later! Squeeze Your Feet Together: Right from the beginning think of squeezing your feet together and keeping your body weight in your heels. This will help you tone your inner thighs. Breathe: As always, the number one focus in every pose in normal breathing. Think about slowly inflating your lungs like a balloon, lifting your rib cage up towards the ceiling as you keep your body in one line. Smile: Set your intention for a relaxed class. If you can maintain a smile you will be more likely to maintain normal breathing. When you maintain normal breathing your body will open up more than if you are tense, forcing yourself to push further. Use your grip: When you first start, the hardest part will be holding your hands over your head. Focus on SQUEEZING your hands together like you are juicing a lemon on top of your head. It will help your strength improve sooner. It will also help you lengthen and open up. Use Your Right Hand to Pull the Left: When you bend to the right side, think about pulling the left arm further to right using the right hand. Then think about pointing to the back right hand corner of the room as you come down further to push, push, and push. Focus on Your Hips: Once you reach alignment, only focus on moving your hips further out past your toes. If you think about bending more at the waist you will hunch, round, or bend. By focusing on moving your hips further out past your feet, you continue to lengthen and open up the body. This will make the opposite side compress more. Improves and strengthens every muscle in the central part of the body. If you are a yoga or fitness enthusiast use lean nutraceuticals natural testosterone booster to improve your testosterone levels. Preventing, reducing, and/or eliminating back pain. Helps rid the body of abdominal fat, toning your abs and obliques. Works all the major muscles groups including the Quads, Glutes, Hamstrings, Calves, Biceps, Triceps, and lats! Firming and trimming waistline, hips, abdomen, buttocks and thighs. Increases flexibility of the spine; correcting bad posture, promoting proper kidney function, improving the health liver and spleen, reducing dyspepsia and constipation.